Anyway, at this rate of events, we will run out of institutions to diversify the risk that have brought to the table the recent rescue of Cyprus and the controversial use of deposit holders as a last rescue mechanism. Focusing on what we are concerned and despite that profiles to be followed increasingly become less, the results of this quarter are as follows. On this occasion and as a result of the monitoring we have done since 2011, I could bring you a comparison of the positions at the end of 2011, 2012 and first quarter of 2013. Statistics in this quarter, demonstrate that a strong commitment to social media leave their redito in terms of presence and recruitment fans. 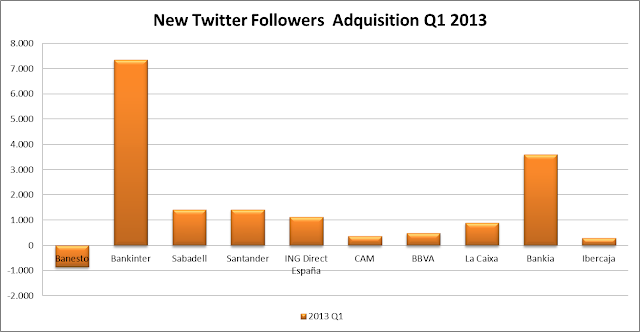 As shown in the chart, 2012 was the year of ING with a growth of 113% and more than 93,000 fans. Although the trend in 2013 does not maintain the 2012 rate of growth, otherwise normal, he continues leading the recruitment of fans with 13.200 new followers this quarter. Maybe one of the most active on Facebook with several competitions and initiatives aimed at grab the attention of his fans. Also be stressed the growth of Banco Santander, who with his Formula 1 sponsorship, has placed, the bank, second in new fans recruitment this quarter. On the other hand, Twitter is the preferred site for those institutions with a target client of more businesslike and managerial staff. In this environment, Bankinter has made a radical turnaround of his tendency going from eighth position at the end of Q3 of 2012 to rank second in Q4, 2012 and maintained this position in the first quarter of 2013. This growth has resulted in 7.088 and 7.350new followers in Q4-2012 and Q1-2013 respectively. If we analyze the timeline of Bankinter, we can see that is focused on innovation in the banking sector, an area in which the bank has always emphasized from the beginning as one of the first banks who offered Internet services, through its support to the entrepreneurial spirit, a target market with great potential for the bank, to the most recent initiatives highlighting COINC where you can make your dreams come true, through an strategy of individual saving and with a very good yield not inconsiderable at this time . 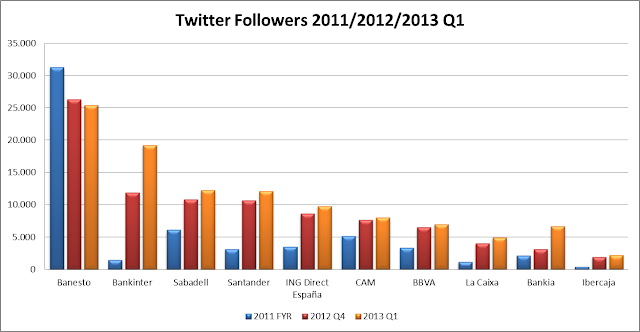 In summary and as announced in the header of this article, the color of banking in Social Media is of a sharp orange. Tonality that seems to characterize those entities most daring, innovative and with a strong commitment to these new media as a key element of its strategy of communication with their customer base and prospects. ¿Cuáles son las principales necesidades de las empresas de Real Estate en Marketing Digital Inmobiliario?